Thirty-five people have been killed in an explosion at Moscow’s Domodedovo airport according to the airport spokesperson. Up to 180 are said to have been injured in what the Investigative Committee believes to be a terrorist attack. 117 people have been taken to nearby hospitals, up to ten of them are reported to be in critical condition. There are foreign citizens among the victims, including from the UK, Italy, France, Serbia and Slovakia. Among those injured in Domodedovo were 12 people from European and CIS countries – from the UK, Germany, Italy, Slovakia, Serbia, France, Tajikistan, Moldova and Uzbekistan. Out of the 35 people who were killed in the blast, three lost their lives in the hospital and one died in an ambulance. Hotlines are operating to assist those seeking psychological help. Psychologists are also working among passengers at the airport. “The main type of injuries are shrapnel wounds and broken limbs,” said Aleksandr Nikolaev, the chief medical officer of the 1st Gradskaya Hospital, one of the hospitals treating the victims. Wednesday, January 26, has been declared a day of mourning for the victims of the blast, in Moscow and the Moscow Region. 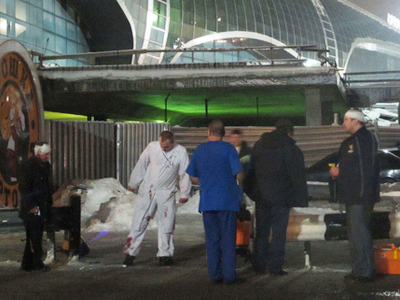 Emergency teams have removed the bodies of the dead from the scene, Interfax reports. On Monday night, the head of Russia’s Investigative Committee, Aleksandr Bastrykin, was briefed on preliminary results from the investigation. “Earlier at the airport, Aleksandr Bastrykin held a meeting with investigators and members of various task forces,” the Investigative Committee announced on its website. More than 60 investigators and forensic specialists are currently working on the scene. The explosion was definitely a terrorist act, investigators at the airport say. They believe a man wearing an explosive device was in the crowd of people meeting arriving passengers. There are reports that the bomb was packed with shrapnel. Russian President Dmitry Medvedev says the management at Domodedovo Airport is to take responsibility for the deadly suicide blast for not having had effective security measures in place. “What happened at Domodedovo shows that the airport lacks security. It's unbelievable that such a huge amount of explosives was brought into the terminal. Those officials responsible for security in Domodedovo must be punished for their decisions. 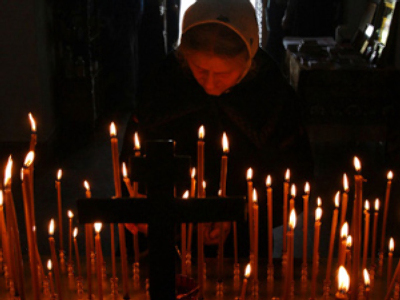 For this terror attack – grief, tragedy,” the Russian President said. According to the Investigative Committee, airport documentation regulating safety is being seized by law enforcement officials. A criminal case has been launched on charges of failure to meet transport security requirements at Domodedovo Airport, the spokesperson for Russia’s Investigative Committee, Vladimir Markin, said on Tuesday. According to security expert Magnus Ranstorp from the Swedish National Defense College, terrorists have attacked a very vulnerable area at the airport, which is typically difficult to protect. “It happened in an area that was not inside the security cordon and therefore, it was relatively easy to go into that but of course there have been reports that the security service has received reports that there was a warning,” he said. The Investigative Committee concluded Tuesday that the attack was carried out by a suicide bomber. His body body parts were found at the scene according to Interfax news agency. Reportedly it is a man of Arab appearance. The authorities are trying to identify him. Several possible accomplices are also being sought – three men who may have dropped the suicide bomber off at the airport prior to the explosion. There is no indication yet as to who might be responsible for the deadly attack. A terrorist act in the major international airport of Domodedovo in Moscow claimed 35 lives and left over 150 people injured.
. Please, consider thoroughly before looking at the atrocities that terrorism brings. The explosion happened at 4:32 p.m. in the international terminal of the airport. The explosion power was equivalent to 5 kilograms of TNT. "The explosive device was most likely filled with pieces of metal, based on there being a large number of injured people and the nature of the injuries,"
Itar-Tass quoted a source close to the investigation as saying. 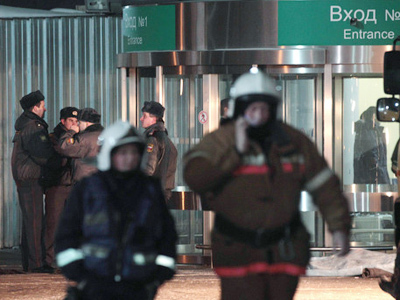 “The explosion occurred outside the control zone, at the exit from the green channel where no metal detectors are installed,"
A source in Russia’s law enforcement told Interfax news agency that traces of plastic explosives have been found at the site of the blast at Domodedovo. Also, specialists who work at the site say that it is impossible to claim with certainty that the bomb was packed with shrapnel. “There are really metal fragments in the bodies of those killed, but it is possible that those are pieces of metal baggage carts, hand-luggage and other [metal] things that were not far from the explosion epicenter,” one source said. Specialists also do not rule out that the explosive device was detonated by remote control, though they tend to the conclusion that it was a suicide bombing. At the time of the explosion, there were a large number of people at the airport because about 30 flights were due to arrive, including 15 international ones. A criminal case has been opened into the apparent terrorist attack. Police are searching for three suspects in connection with the blast after watching airport security camera footage. Surveillance cameras also caught the moment of the explosion. Three men who have been living in the Russian capital for a certain period of time reportedly took part in organizing the blast, a source told Interfax news agency. He also noted that these three were believed to be Russian North Caucasus militants and might have been somehow connected to two women, one of whom blew herself up at a practice range club in Moscow on December 31 and the other was later arrested in the city of Volgograd. "She is in intensive care,” Elena said. “The blast happened in the arrivals area – that’s the left wing of the airport. The explosion must have been very strong, because our cafe is somewhat a hundred meters from the arrivals area. And when we heard the blast, plaster started falling from the ceiling". According to other similar reports that emerged shortly after the incident, security services were aware about the possibility of a terror attack in one of Moscow’s airports but failed to prevent it – RIA Novosti quoted an unnamed source in Russia’s law-enforcement services. The agency’s source said that three suspects “made their way on to the territory of the airport unhindered, monitored the explosion that was performed by their accomplice and left the airport.” Most likely, the suicide bomber was brought in a car and dropped off at the parking slot on the left side of the airport, the source added. However, Moscow police information chief Victor Biryukov insisted that the police were not aware of any plans related to the terror attack. "We officially declare that Moscow police did not possess any information about preparations for a terror attack,” he said. ­Moscow police have been put on alert over possible terror attacks in the capital. They are also on alert at Vnukovo airport and Sheremetyevo international airport in Moscow, and in the metro system. The security measures have been increased in all the major transport hubs, including metro, airport stations and other airports. ­RT has explored Moscow's underground network to find out what's being done for protection there. Russia's Anti-Terrorism Committee says the situation at the airport and across Moscow is under control. Starting Tuesday, large-scale checks of anti-terrorist security measures at airports and railway stations have commenced in Russia, the Prosecutor General’s Office spokesperson Marina Gridneva said. The Moscow government is to pay compensation to the families of Muscovites who died in the blast. Burial services will also be paid for from the city budget. The president has delayed his flight for his trip to the Davos economic forum, scheduled for Tuesday, Medvedev’s press secretary Natalya Timakova says. 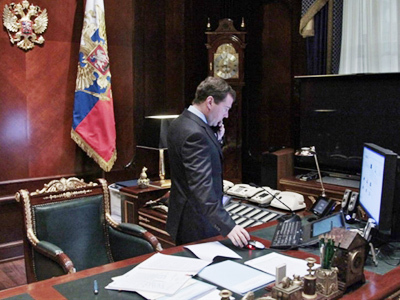 President Medvedev has also held a meeting with the Federal Security Service officials. He told them that finding those who are responsible for planning the bombing at Domodedovo Airport is now their top priority. And once the culprits are found, they should be brought to court – and if any resistance is put up, the “nests” of the perpetrators should be rooted out. As for those who are responsible for the security of passengers in Russia, President Medvedev said they have not followed laws on anti-terrorism properly, and were partly to blame for what happened. ­Meanwhile, all airports in Russia are stepping up security, first of all in the Moscow region, Itar-Tass news agency reports. Still, Domodedovo Airport is working without restrictions, both for arriving and departing flights, said the Federal Agency for Air Transportation spokesman (Rosaviatsia) Sergey Izvolsky. Political analyst Dmitry Babich believes that if the news is confirmed that the blast was caused by a suicide bomber, the situation will be even worse and the investigation will be led up the so-called “Muslim track”. “Usually the Islamist fanatics have this [particular] way of committing terrorist acts. If that was a suicide bomber, the whole idea was to show, that: ‘Not only can we kill a lot of people, but we have people who are ready to sacrifice a life!” he said. RT’s political commentator Peter Lavelle says that all of this is a fundraiser. “These people are not going to win what they are doing, but they have to show their fund providers that they can still pull this off. It’s big and it’s a big message: ‘We can still get under the radar of Russian security services.’ It’s a challenge!” he said. ­Journalist and author Phil Rees believes that the finger certainly points at the North Caucasus. ­According to political analyst Aleksandr Nagorny, it is unlikely Chechen militants are to blame for the Domodedovo blast. ­“All indications are that this is part of the insurgency going on in the North Caucasus – unless we hear evidence of other suspects,” Dennis Sammut, executive directors of Links, told RT. “I think that it's natural to suspect that it's people involved in the insurgency in the North Caucasus that are behind it. We have to keep in mind that the insurgency in the North Caucasus now has connections with other terrorist groups in the Middle East and other parts of the world. We are probably seeing yet another outrage, another attack against civilians in the same pattern as happened in New York, in London, in Paris, in Madrid and other parts of the world. " ­Sergey Strokan, a political analyst and a journalist from the Kommersant newspaper, told RT that it is too premature to lay the blame for the deadly blast with anyone in particular. "I've seen on the web that some Western media was quick to say that this might be done by a group or a batallion of the so-called suicide bombers, who are under the control of the ex-Chechen rebel leader Doku Umarov, but let me emphasize once again that it's too early to speak about who specifically was responsible for this," Strokan said. "On the other hand, one thing is definitely clear – it was done by the so-called 21 century terrorist group," Strokan added. "It by no means can be called an act of individual due to two reasons – first, it was definitely a powerful explosive device, which could have been accessed by a certain group and the second – is the place of the terrorist act." Chris Yates, an aviation expert, told RT there are fears that similar attacks could happen anywhere in the world. "It's always been a great fear among aviation security professionals around the world that airport terminals themselves could potentially be seen as the target for those who wish to do us harm,” he said. “And that's precisely what occurred today. A public area [offers] reasonably easy access… to anybody who wishes to blow themselves up." ­Paul Lashmar, an investigative journalist based in London, agrees. He says not only Domodedovo, but any big transport hub that is vulnerable to such attack. “So, you’ve really got to have very tight security immediately, but ultimately it’s very, very hard to protect all transport hubs in a capital city, I think,” Lashmar concluded. 4. 25 – S7 924 from Burgas (Greece) and UN 7444 from London(UK). ­The last confirmed terror attack in Moscow happened in March 2010, when twin blasts at two Moscow Metro stations killed 40 and injured almost 90 passengers. The attack was carried out by female suicide bombers from the Chechen Republic. 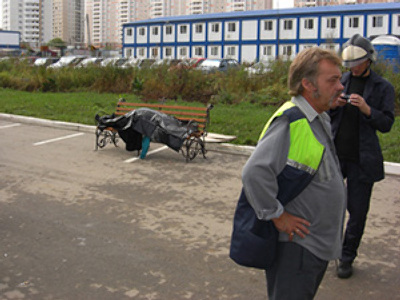 Earlier, in August 2006 a blast at Cherkizovo marketplace killed 14 and injured 61 people. The attack carried out by Russian nationalist extremists targeted migrants working there. In August 2004, a suicide bomber set detonated explosives near a Metro station. It is believed her intention was to carry out the attack underground, but her nerve failed when police noticed her strange behaviour and tried to investigate. The blast killed ten and injured 33. In February 2004, a suicide attack in a running Moscow Metro train killed 41 people and injured some 250. In December 2003, a suicide bomber set off an explosion near the National Hotel in central Moscow. It killed six people and injured 14. In June the same year, two suicide bombers killed 16 and wounded some 60 people at the Krylia rock festival at Tushino airport in Moscow. In October 2002, a 40 to 50 strong gang of militants took more than 900 people hostage in a theater in Dubrovka Street in Moscow. They planted explosive devices in the crowd and threatened to set them off if their demands are not met. The four-day stand-off ended in a raid by Russian anti-terror troops, who used poisonous gas to disable all the terrorists. The gas killed about 130 of the hostages. In October 2002, a car bomb parked near a McDonald’s restaurant killed one person and injured eight. In February 2001, an explosive device planted at the Belorusskaya Metro station injured some 20 people. The perpetrators of this attack have never been identified. In August 2000, an improvised explosive device at an underground walkway near Pushkinskaya square killed 13 people and injured 61. In September 1999 there were two bombings, with a six-day delay in between, in the basements of residential buildings in Moscow. The total death toll was more than 225, while some 700 people were injured. It was the worst-ever terror attack in Moscow. In August 1999, a bomb killed one woman and injured 41 people in a trade mall at Manezhnaya square.